As we’ve all seen by now in Kevin’s real world durability test, the BlackBerry KEYone has been purpose built to offer a distinctly different, highly durable smartphone experience that can live up to normal everyday use. In a further effort to ensure all our BlackBerry Mobile customers and fans have an outstanding experience, we’re implementing additional measures that add even greater strength and adhesive to the BlackBerry KEYone display. These new measures are already being implemented on new KEYone’s and are beginning to hit our retailer and carrier inventories – and will continue to come in stock throughout the summer. If you’ve already purchased the BlackBerry KEYone, you’re fully covered by our manufacturer’s warranty, so if any issue arises, please contact us and we can help you with a warranty replacement if needed. ssilva7, hjc73734, Grabber5.0 and 11 others like this. In Australia the KEYᵒⁿᵉ was officially released only this week at AUD $899 , so how do we tell if it's part of this corrected batch? Is there a box date, or some other way of knowing? Build date is on the phone back cover plastic sticker. Anything built after TODAY would be good I assume. haha. The tech used 2mm wide double sided tape. Search amazon for "phone repair tape 2mm" you will find many options. I do not think it would be hard to do yourself, I just have ham hands and poor eyesight. For such a simple fix, I really do not see why someone would not just go local to get it repaired simply and quickly. It is not as if the phone does not work, it just needs a bit of adhesive to correct. I fully understand that we should not have to do so with a new phone, but my time is too valuable to waste chasing outrage. I bought a new car once and it managed to lose ALL of the oil overnight all over my driveway. Seems the oil pan drain plug was not properly torqued. I just replaced the plug, filled it back up myself. A couple bags of kitty litter and some powerwashing cleaned up the oil. I told the dealer about it just to save the next ******* from the same fate if it was some sort of recurring issue. I still feel the KeyOne is the perfect work phone for me. I simply cannot abide a touch screen phone. Is yours holding up so far? Called Blackberry support first, and they recommended I exchange it through Amazon (where I bought it). Contacted Amazon and they won't exchange it because I purchased my phone on May 31st. They wanted to refund me, and I don't want that. Contacted Blackberry back, so now we're going to do the warranty exchange. Since Blackberry doesn't have the parts, they're going to replace it. BlackBerry Mobile and Superfly_FR like this. anywhere that we can get the production date that has screen lift issue? I am having my keyone for a month.. I have checked the box and the only thing that I assumed related to production is the PRD number.. The UK version apparently has a date on the box, but the ca/us version doesn't. It seems that for the us/ca version there's no easy way to identify a date, and apparently can't be accessed via internal device software either. I've found, so far, any phone produced before July 2017. The new builds with the correct adhesive are still being sent to retailers, and it can take through the rest of summer before they show up for sale again. When I get my new unit, I'll try to remember to post the build date. I'm in the UK, had a chat with you via Twitter last Sunday, Monday I called the hotline as advised and been told that I will get a replacement in 3 days but to send mine to SBE (independent repair center) first. 1 week now and all I got is a repair number to track the status ("with techincian") - NO REPLACEMENT - and no reply from support@blackberrymobile.com to my email regarding this. Friday I managed to reach the repair center (after 45min on hold) where they told me to check back in 5-7 days as they are very busy - chasing the repair - NO Replacement? I was expecting for you to deal with the issue a little more professional and send me a new revised unit, as promissed within 3 days. I am very dissapointed and angry about this, I regret sending and not glueing it myself, frankly. Last edited by herr_tan; 07-09-17 at 03:14 AM. Thanks for your genuine response to Blackberry's update. Judging from your experience so far, it appears that my google search for the UK repair centre found exactly what you're experiencing, terrible service from that company. I'm waiting for my returns label and already have concerns about any repairs. 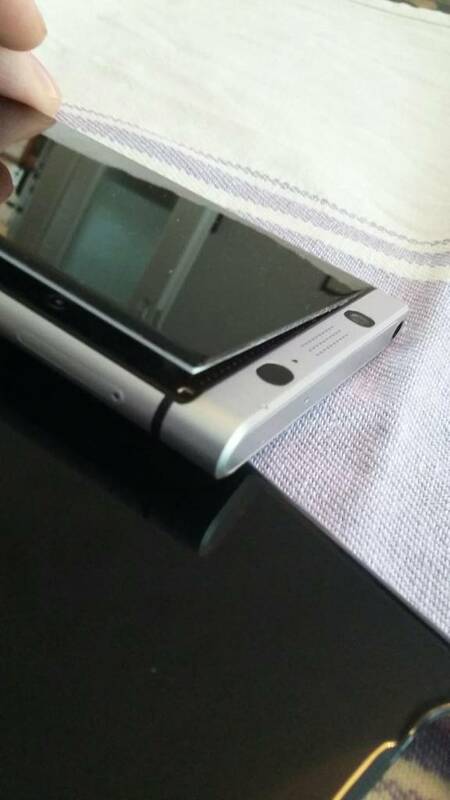 Blackberry, why don't you just do the right thing and replace our affected phones with the latest model KEYone? As I've said, my phone lasted over 2 months before the screen simply fell out, so what's to say that this won't happen again if the repair company that you're using in the UK are bad? This isn't helping your already damaged reputation! Just saying. It's not about the reputation of the repair company but about the whole way of dealing with this. BBSupport Hotline: "you will get a replacement in 3 days"
AlcatelSupport: "put the device in an envelope and send it to SBE - track your repair"
SBE after 4 days: "your device might be covered by the warranty - is with our technician - check back in 5-7 days as we are busy"
- the shipping ticket came from Alcatel Support Center and took 2 and a half days to get to SBE (freepost). Note that: from the moment you get the RME number from support@bb it takes about 30h until you will get the freepost from Alcatel. After all of this, BB says the new batch has been revised..but we don't get a new one - we wait for the old one to be repaired? The whole thing resulting in a dissapointment after We've paid £499 for a device that adresses our needs. I've found, so far, any phone produced before July 2017. I've tried defending the KEYone from the vitriol of quite a few folk on here that don't even own a KEYone. I'm not happy that my screen fell off after over 2 months. You are right, this isn't about the repair company, my point was to highlight that even Blackberry could have googled the UK repair company to find what I did and what at least one person has previously posted of their experience. got 2 Keyones, both have production date 30th may. so far so good. if the screen lifts, then I glue it myself. Ill send my keyone away tomorrow for repair/replacement. I hope I get a new phone with any amendments incorporated. Nice to see a response from BlackBerry Mobile! I agree 100%. How the warranty is fulfilled is of prime importance to excellent customer service. Amazon and Cisco excel in this. I ordered my Passport through Amazon. It had serious Bluetooth issues. I called Amazon and with no questions asked I received the replacement in two days with a return box for the faulty unit. This also gave me the opportunity to transfer the contents of the first into the replacement, and I could wipe the faulty Passport. Here's another example of great customer service. Two weeks after the warranty ran out my Bonavita coffee maker stopped brewing after two cups. I have to restart it three more times to make 8 cups. I called Bonavita and they told me to fill out a warranty claim even though it was out of warranty. I did, it was approved, and my new, replacement coffee will be here in 3 days. That is excellent customer service. That is the sort of action I expect when I spend this kind of money for an expensive phone. It's nice for BB to have a response eventually but it doesn't actually say anything unusual or unexpected - drives me nuts when I see these kind of marketing addressed statements - around the bush. I'm trying to understand why they choose to deal with it differently - to keep the costs down? As a person who worked 20 years in Customer Services I think this is the worst way of dealing with such a problem - at least in the UK. We are the BlackBerry users - faitful and professional. Hello Ian hope you get this resolved quickly! What a surprise as you were taking such good care of your KEYone! Keep me on the loops how it goes. BBM Group updated with your situation. Thanks for getting back to me & letting the group know. Yes, it's a real bummer, totally unexpected & no warning, screen just fell out! Will keep you posted my friend. Rico4you and Anilu7 like this. Why isn't Crackberry reporting on this? I just contacted Blackberry Mobile support and he told me it was a known issue. Crackberry used to be a all-blackberry-news website. Shouldn't this be made public? Is Blackberry KEYone right for me? Do you think we can isolate the batch/country/model/retailer of the screen lifting? Camera App should record "KEYOne" in image metadata, not "BBB100-1"